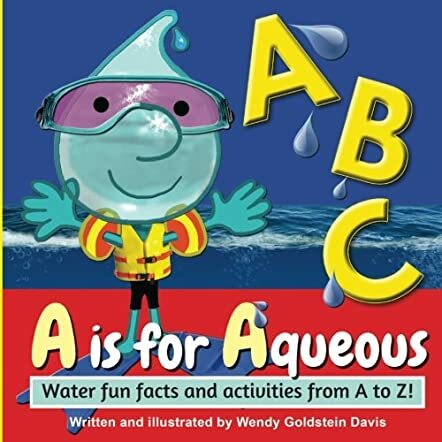 A is for Aqueous by Wendy Goldstein Davis is an educational and interactive book for children that will teach youngsters the letters of the alphabet with the help of Aqueous and his friends. Teaching and learning can be fun if done in the right manner and the author knits science and language together to make it a fun book for children to discover science and reading at an early age. The rhymes, pictures, water facts, and the interactive approach to learning make the book refreshing and original when compared to many other books where learning the alphabet becomes boring. This book not only introduces readers to the alphabet, but also makes young readers creative and imaginative, along with improving their vocabulary. This is one of the best books I have come across when it comes to teaching the letters of the alphabet to children. The inclusions of water-related references make it more educational and informative to readers as it tells them a lot of new things, apart from teaching the alphabet. The rhymes make it appealing to young readers and the illustrations are funny and charming, and what a good way to make learning fun for readers! The book is definitely a must-have in school and children’s libraries as teachers and educators will find it easy to introduce children to science and language with ease. It can be a wonderful addition to the library at home because it is much more than a book that teaches the alphabet. I am looking forward to more books from this author!